i woke up 20 minutes before landing at keflavik when the plane banked and a host of cellophane-wrapped dinner rolls tumbled over the aisle at me. i was in reykjavik an hour of traffic later. ben got me from the bus terminal and we unpacked everything. the assorted equipment filled up the small room in gamli gardur, the hotel next to the national museum of iceland that the university of iceland has converted into student housing. we went to pick up a HD video camera from the rental store on borgartun (rental largely funded by the generosity of the icelandic fulbright foundation), then ben went off to his last class of the week ("introduction to runes") and i went to a shower. the shower facilities in gamli gardur are not unisex; additionally, they are labeled only "karlar" and "konur" and accompanied by tiny person icons presumably intended to signal who goes where but actually are indistinguishable from each other. the hot water was abundant and smelled mildly of hydrogen sulphide. we made lunch—"alfredo sauce" featuring canned corn, covering an earwig-shaped shell pasta whose package claims it to be gnocchi. use minimal material not native to the site. build light-permeable structures in series and kindle small fires inside them. photograph and/or videorecord fires burning inside them from dusk through full fall of night. cairn of stones, ring of ice blocks, stack of driftwood. the flickering and fragmentary light should be pearlescent in the ice, sharply-outlined in the wood, and pointillist in the cairn. the fires will be relatively small, built of driftwood, and contained in aluminum baking dishes so that we can introduce and remove them easily. dark-art. Things built and removed during the night. These may not have fires. So may not even be possible to see them. A colored iceberg? Use food-coloring to color water bright orange or red, then freeze it and release into a glacial lagoon among the other icebergs. Aerial fires. Suspend an item. Then burn it in mid-air. Possibly combine with (6) and burn it as it hangs off a cliff. the equipment also included a bright blue hazmat responder training suit (purchased on ebay, shipped to a certain vince tan, finally tracked down, and then hauled to iceland over thousands of air miles) and a rented video camera because there are additional—and at this stage in the project, mostly-unformed—plans to shoot a short film about a visitor to a planet of snows whose suit marks and protects him. the car (a suzuki jimny) packed, we left reykjavik around 1.30pm and headed east onto 1, the ring road that runs 1200 kilometres around iceland. reykjavik is about the size of manhattan. it recedes rapidly and the road unspools ahead into vast expanses of mostly-unfilled space. 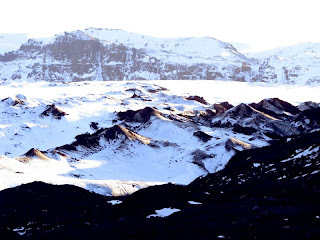 on the right, there is sea and, on the left, high, jagged basaltic mountains covered in snow variously a dim grey or a blue-white as the sun passes behind a thin, growing layer of cloud. the sky is at times so white it doesn't seem like sky. 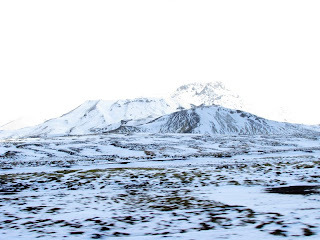 most of the three hundred or so thousand people on iceland live in reykjavik, akureyri, and surrounding communities. 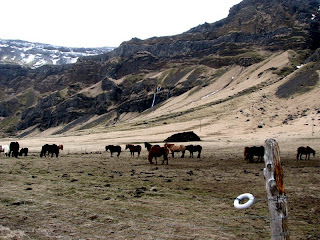 the remainder of the population is spread thinly across the margins of the island: a diffuse community that appears to mostly fish, grow greenhouse vegetables, and raise icelandic horses (fuzzy, stocky, and heavily-maned) and dairy animals. we stop for gas and provisions at a grocery store in vik. there are not many towns, even on the main highway, that are big enough to support a market. the dairy case is fully-stocked with many and enormous blocks of cheese from a variety of icelandic producers; we have the choice of mild and extra-mild gouda. 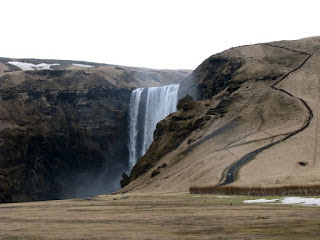 around 6pm on the first day, we arrive at the waterfall skogarfoss, where the falls have carved out a region at their base such that they are fronted by a piece of land overlooking a sandy beachlet. here, we shoot the first of many short and enigmatic snippets featuring the man in the blue hazmat suit. as it turns out, the suit's faceplate fogs up almost immediately, turning the landscape into a haze in which even large and pointy rocks are difficult to make out. we film suitguy walking disconsolately toward the waterfall and pausing often to evaluate his footing, then leaping off the edge of the land right in front of it and vanishing into a chasm. trouble is, ben has not caught this spontaneous effusion of the actor's craft on tape and i have to do it again. after almost an hour of monkeying about near the base of the falls, we've confused a few tourists visiting the falls for serious sightseeing and become damp with the mist coming off the falls. the light has begun to fade and sheets of rain have appeared in the skies over the sea far to the south and we move for skaftajokull, a tongue of the larger glacier myrdaljokull, about 30km to the east, to make camp for the night. in gathering darkness, we pitch the tents in a spot south-east of the glacial protrusion. it only gets dark after 9pm and the glacial ice glows softly as the long evening fades. we cook and eat, then play a few rounds of scrabble. outside, after dark, the wind rises and the temperature falls.